"O!" or "NUR Telecom" is the third operator in terms of the mobile market coverage in Kyrgyzstan. It has 20% of users of cellular communication in the country, which is about 1.1 million subscribers. Having appeared on the market in 2009, the operator is actively gaining customers by offering the lowest prices for calls and optimal connection conditions. "O!" provides 3 basic prepaid packages. They are "Change for O! ", "Onoi!" and "Bishkersky". The first one includes 8 additional lines: “Light +”, “+”, “VIP +”, “Premium”, “South”, "Talas", "Naryn", and "Issyk-Kul". That makes 11 prepaid plans. Optimal for the termination are "South", "Talas", "Naryn", "Issyk-Kul", and “Light +” ("Change for O!" packages). When connected to "Tushtuk" aka "South", one minute of the call will cost $0.00028. This rate includes a $0.58payment a week. It is suitable for voice termination as it implies cheap local calls and loyal antifraud. To go to this tariff plan, you need to dial a combination of digits *155* 77#c. When you connect to the "Talas", "Naryn" and "Issyk-Kul" Slightly packages, a minute of conversation will cost more expensive: from $0.00031 to $0.00038. These tariff plans include $.65 and $0.79 prepayment a week under the same conditions. According to the terms and rates, you can put the tariff plan “Light +” ("Change for O!" package) in the third place. Traffic termination will cost $ 0.00066 per minute. At the same time, a prerequisite is a $ 1.37 prepayment a week. When calculating the income to get via "Nur Telecom", terminators should take into account that all packages are meant for intensive communication within the network, so they are not as vulnerable to blocking by the antifraud systems. 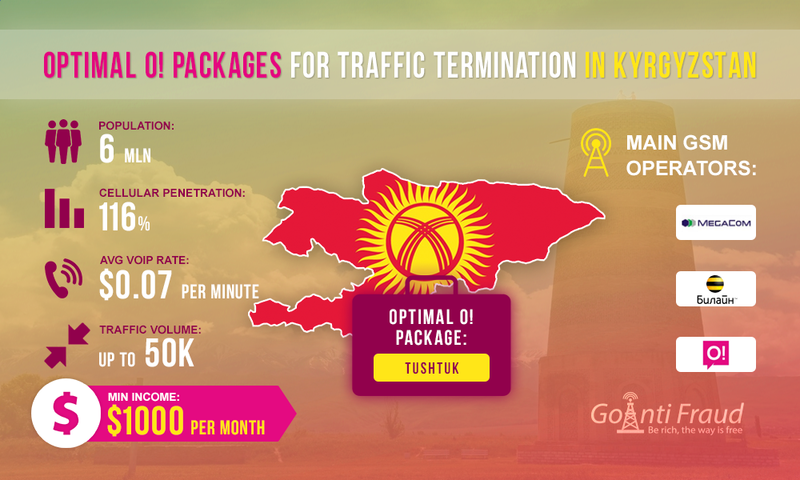 According to Kyrgyzstan VoIP forums, you can find a lot of offers from originator companies that are willing to provide traffic for the final termination. Income per month via "Tushtuk" from "O!" will be $1,000-$1,200 and above, from a single channel of your equipment. Experienced terminators install 8-32 channel gateways to increase their earnings.